Kgalagadi and Etosha are our favourite parks. We spend about 6 weeks in the Kgalagadi each year. We vary the timing between the wet and dry periods, making sure to avoid the school holidays. 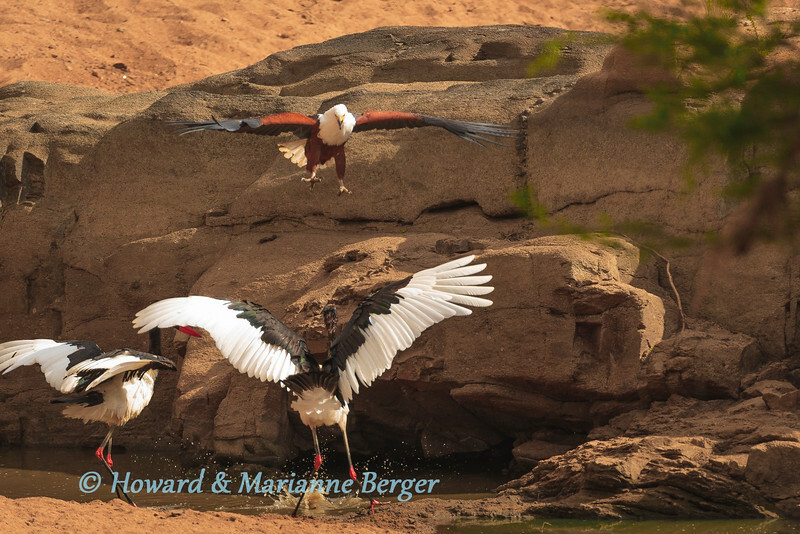 In the summer it is very dry and wonderful sightings are made around the waterholes. However they are artifical boreholes and often very ugly with exposed bricks and mortar. Thus composing a natural photo can be difficult. 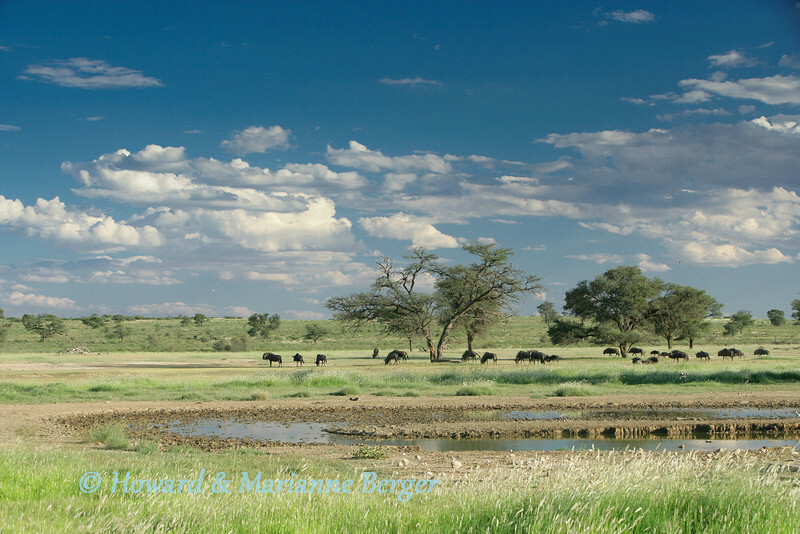 Huge changes occur at the waterholes after the summer rains and though the game is more dispersed the pictures are more dramatic with large pools, massive clouds, green veld, and colourful flowers framing the animals. This leopard (Panthera pardus),appeared to be about to climb down the tree again and so I swiftly turned the view to vertical so as to also fit in the long tail. Oh well you get some and miss many! 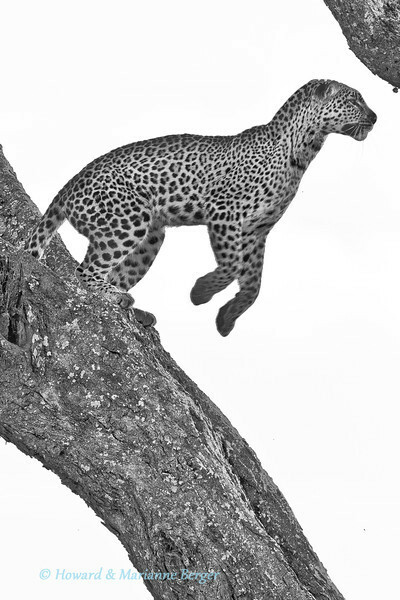 The leopard jumped horizontally across the view! The next shot was even better, with him in mid air but without a head! 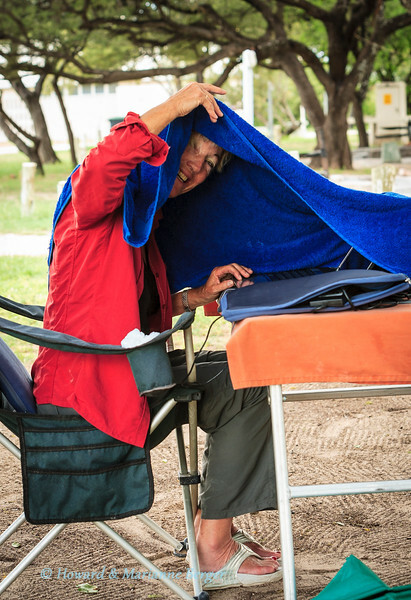 (Seronera river, Serengeti National Park, Tanzania) Trying to predict an action is fun but very difficult. The rules that birds will fly off into the sun and against the wind, and also warn you by defecating first are useful but far from infallible. This I've learnt after long waits with eye glued to viewfinder and my neck aching. Thus (see above) I often prefer to guestimate the birds flight path and fix my camera position with the Wimberley gimbal all tightened up.The body of the bird is framed almost outside the edge of the viewfinder and thus giving me time to shoot as it hopefully (!) flies off across my predicted view. For this. I use my remote trigger, and thus can comfortably can gaze thru the window opening & concentrate for much longer to capture the decisive moment. (see tip above). Marianne & I (back seat & front seats respectively), have different focal length telephoto lenses, and so choosing the parking distance from the bird (to diminish incidence of amputated wings) is a subject for friendly debate at times. Remember in heavier birds the take off trajectory will initially be more downwards compared to lighter birds, especially if carrying a kill. In the early morning black-faced Impala (Aepyceros melampus petersi), and elephant (Loxodonta africana), drink at Kalkheuvel waterhole. Of course, as in all game parks, as you drive you may encounter wonderful sightings and with luck the sun may be shining from the right direction. The boreholes e.g. Newbrowni, Gemsbokvlakte & Olifantsbad also attract large numbers of game, but the pumps, pipes, and cement sometimes make composition difficult. 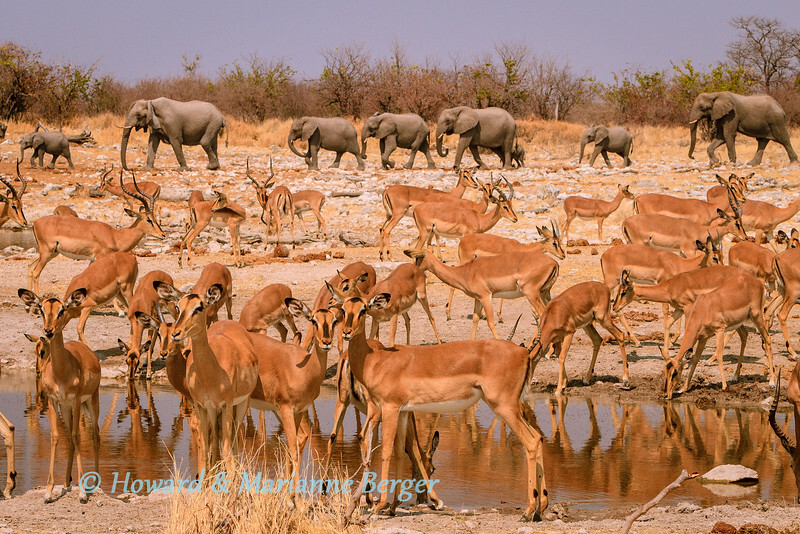 We prefer to spend our time at the wonderful and open natural waterholes that are scattered over Etosha National Park. We will list our favourites according to to which camp they are near and then subdivide as a sunrise or sunset waterhole. Okaukuejo Camp:- The waterhole at the camp must be the best waterhole in Africa. At sunrise the sun is behind you and the animals glow. The backlit sunsets can be wonderful as the animals kick up dust coming to drink. Also wonderful at night especially later on when most tourists are fast asleep. Otherwise our favourite watering hole is Okondeka, with animals on the pan and lions in wait around the water spring. The morning glare is harsh, and we go in the late afternoon. Be prepared for long drives in this area, especially if you go back to camp for a lunch break. Halali Camp:- Also a good waterhole at the camp but mainly attracting lots of game at night e.g. rhino, elephant, and leopard. To the east is In the morning Goas, wonderful with game around the water in the lush reeds e.g.lion, elephant. In the afternoon Nuamses is a small paradise. We have been waiting patiently there for 7 years for a leopard! On the west side are Rietfontein (for the afternoon) and then Salvadora & Sueda, both face north into the open pan, and so mixed lighting. But nearby and small Charitsaub is ideal in the morning, & although game is sparse there, lion prides do visit the pool. Further west towards Okakuejo is Homob which is ideal in the morning light but the parking place is far from the water. 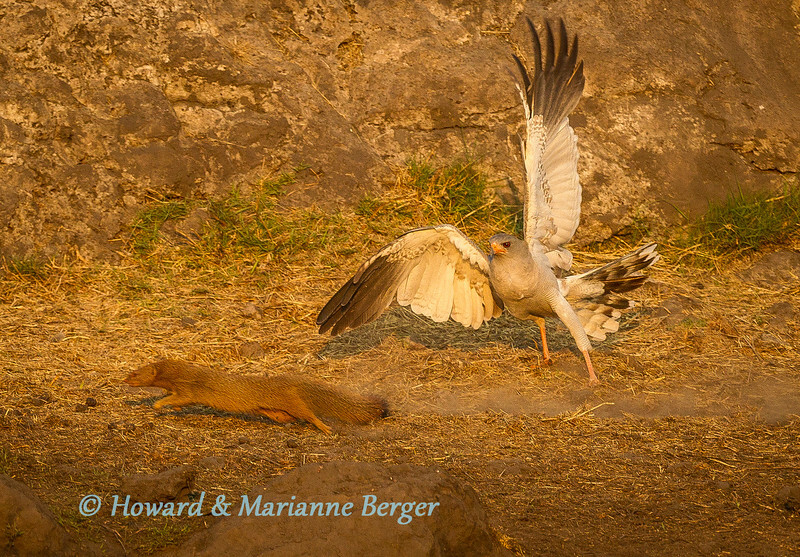 At Nuamses waterhole, Etosha National Park, Namibia, a Yellow Mongoose (Cynictis penicillata) makes a dash for safety as it is pursued by a Pale Chanting Goshawk (Melierax canorus), It did escape. I was completely surprised by this wonderful explosion of action. I have had to crop the picture down to 5Mb to get it large enough to show the action, even though I was using my 500mm lens. I would never routinely sit at this small waterhole with my 1.4 extender attached to the lens. A pity in this case. But of course despite preparation and "anticipation" failures will often occur. We often visit Nuamses in the afternoon and spend many hours waiting. We have had lion, elephants, and a variety of buck and birds coming to drink. This beautiful waterhole is small and near the parking place and dead tree trunks for birds to land on even nearer. 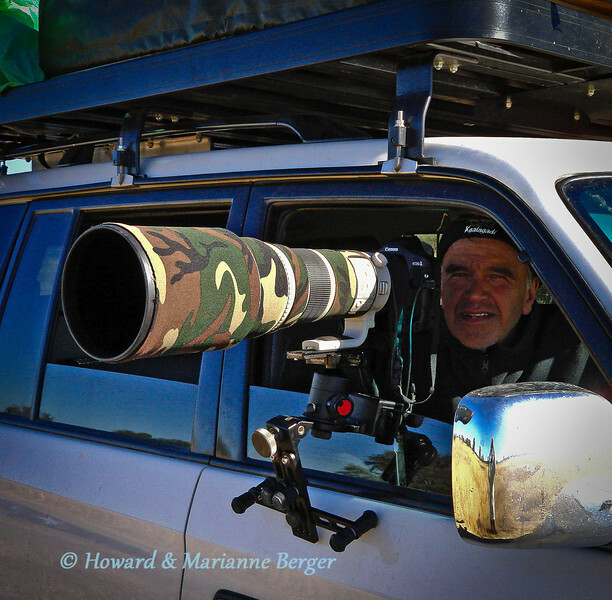 Thus we prepare, setting up our larger telephoto lenses, without the extender, on our window mounts and have our 70-200mm zoom lenses mounted on our second cameras, ready for animal groups coming to drink. We have of course collected many portraits of a variety of animals over the years and now especially look for action shots. So the settings we default to are for action. I usually use manual mode and my wife aperture. We both aim for a shutter speed of 1/1000 or above. Of course doing this means opening the aperture and the disadvantage of the decreased depth of field reveals it self when we have groups of animals. Thus we rather default to f/5.6 of f/8 and increase the ISO value to 400-800 to achieve the fast speed, accepting the noisier (luminance & chrominance artifacts) but sharper action pictures. Of course if the scene is calm we can lower the ISO and adjust speed and aperture to more appropriate levels, but then again revert to action default as soon as we have a few portraits. Thus we are prepared for what we hope, from past experience, will come to drink. Not being ready for the much rarer and wonderful small animal encounters are just accepted,and we then shoot as is. There will never be enough time to add on an extender. The range of ISO values you can use will vary with the price of your camera but less noise at higher ISO values is being obtained in many cameras these days. Remember if you do have time to add an extender, have the discipline to remove it after the scene is shot. Then prepare your default settings again for the next action encounter waiting around the corner! Every day as I brush my teeth I still sadly remember the lion kill I missed because I had left my extender on after shooting birds. I have a great shot of a lion's head and an impala's backside! The background or foreground objects e.g. leaves & branches of a bush or blades of grass often distract attention from the main object e.g. leopard in a tree in a wildlife photograph. In wildlife photography e.g. shooting from a car, our ability to choose a more favorable viewpoint, is often limited. Make the most of opportunities to isolate the animal against an uncomplicated background such as the sky and water. Using the sky is easier with taller animals such as giraffe and elephant. So anticipate their path of travel shoot when they enter a clearing. But remember on a cloudy day to compensate your exposure for the influence of a grey background on the light measurement. 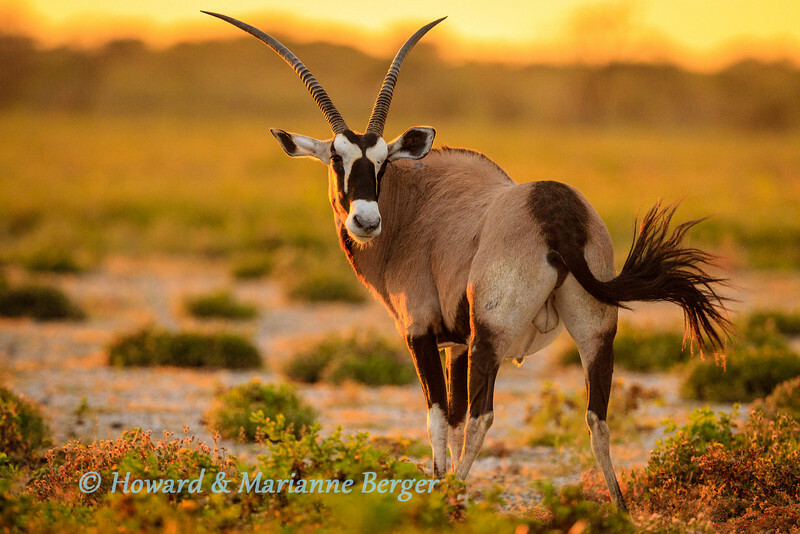 The Kgalagadi Transfrontier Park has high dunes and ridges along the dry river beds and these often allow for shots of giraffe, gemsbok, wildebeest, & springbok with the blue sky as background. This is one reason I prefer to use manual settings for my exposure mode. At larger water holes and river crossings try and take your shot with the blue water as the background. Do not be tempted to get out of the car and lie on the ground for a better view! The professional who do this have a backup watching out for danger! The opportunities described above may be infrequent and thus use a shallow depth of field to make the animal standout from his surroundings. The larger the lens aperture you use the smaller the depth of field. The focal length of the lens, distance from the animal, and use of converters will also influence the depth of field. The blur created is referred to a “Bokeh” (Japanese for blur or haze). It takes a considerable financial investment to buy a telephoto or zoom lens with a large maximal aperture e.g. f/4.0 or f/2.8. Although Canon and Nikon lenses are favorites with photographers Sigma lenses also provide high quality and at a lower price. 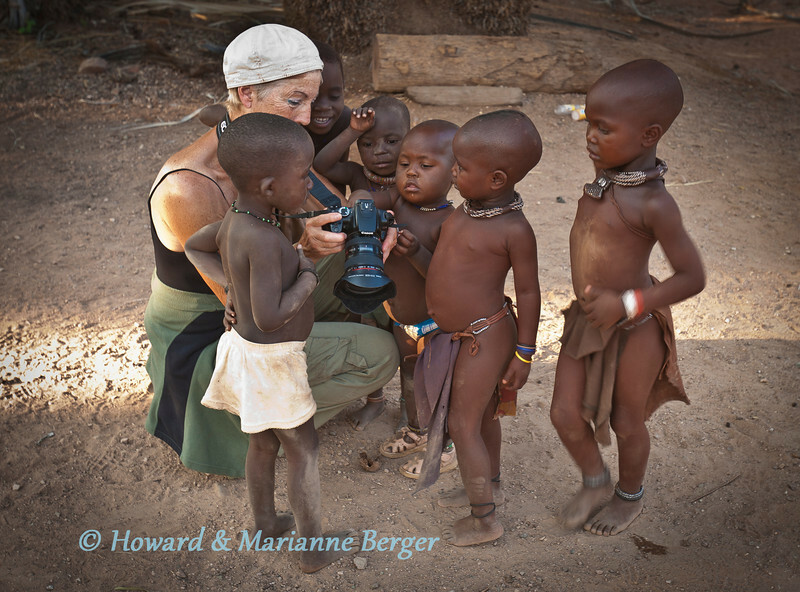 If you are intending to go on repeated photographic safaris or continue your hobby at home e.g. bird photography, you will not regret the long term investment.However what ever lens you are using it is essential that you do not use "programmed" mode for exposure, but rather use "aperture" or "manual" mode, which will enable you to set the aperture on the maximum value possible for your particular lens Of course often the animal is so enmeshed in the bush that no lens will extricate it from its surroundings. Then try and wait for a moment when the head and in particular the eyes are not hidden. The use of Lightroom’s clarity brush or masking technique’s with Photoshop may allow you to synthetically improve the “bokeh” when you return home. Once again remember to focus on the eyes when using decreased depth of field & try and anticipate moments when a greater depth of field may be more appropriate e.g. leopard climbing down tree and walking closer and resulting in a “nose and tail shot” begging for a greater depth of field photograph. 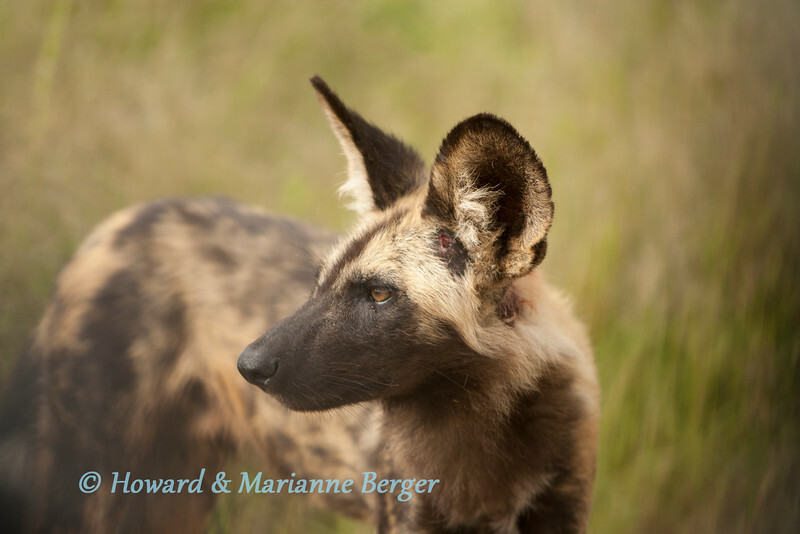 This photograph of African wild dog (Lycaon pictus) gazing intently down the road was taken near Gardenia bird hide, Kruger National Park, South Africa. The Canon 70-200mm f/2.8 lens was focused on the eye. The wide aperture (f/2.8) , maximal focal length (200mm) and short distance created a pleasant bokeh fading gradually over the animals coat to the watery background. Note the wound under the left ear, which may have been due to a fight. ETTR is not always right. “ELLTTR” may be more right! Exposing to the right (ETTR) became popular after Michael Reichman discussed the concept in 2003 on “Luminous Landscape” http://www.luminous-landscape.com/tutorials/expose-right.shtml). He passed on information from Thomas Knoll on signal to noise ratios in digital photography. The ability of a digital sensor to record discrete tonal values i.e. shades of grey, is not evenly distributed over the whole range of exposure. The dynamic range of a DSLR camera varies from 8 to 12 F/stops (zones), however, the first F stop (brightest tones) contains many more tonal levels than the last F/stop (darkest tones, in fact the first F stop records 50% of the tonal values. So if you expose your photograph with the histogram recording mainly to the left (dark side) you are using few of the available tonal values & not using the camera to its best capacity. Another disadvantage of exposing to the left is that darker tones have progressively more noise. On the other hand ETTR does of course bring the risk of overexposure with clipping of the highlights i.e. above a certain light intensity the tones are burnt out & recorded as solid white. They are often not recoverable in the post-processing in Photoshop or Lightroom. Thus you need to carefully choose your exposure strategy. This is clearly discussed in the Cambridge in Colour tutorial http://www.cambridgeincolour.com/tutorials/digital-exposure-techniques.htm). In summary depending on your subject you can use a)ETTR, b) slight under exposure or c) standard with the histogram in the middle. For example with landscape photography with stable light you will often have time to repeat your photograph & so with the help of your histogram nudge the ETTR & have an deal histogram. But in my experience ETTR is a risky practice in wildlife photography where you will often only have a fleeting moment for a shot. I at first adopted the ETTR technique. This changed after I overexposed a unique opportunity of a fish eagle trying to steal a barbell fish from saddle billed stalks (see photograph & serial pictures on home page), I had set my exposure to the right to capture the storks catch barbel fish in a small pool in the Shingwedzi river in the Kruger National Park. They were calmly patrolling in the shadows of the rocks. Suddenly with a scream a fish eagle dived down to try & steal the catch. Of course the alarmed storks spread out their wings, & so I had the eagle head & stork wing feathers acting as white reflectors. As luck would have it the sun also peeped out from a cloud at that moment. Thus my exposure (set in manual mode) now could not record the white head & wing tones which were badly clipped. I tried for years to recover the highlights of these unique shots. Only now with the 2012 Raw processor update have some details become visible in the white wings. So for the nature photography with its unpredictable action e.g. sudden take off of an alarmed bird & at times changes in light i.e. clouds I now use ELLTTR (Expose a Little Less To The Right!). I am particularly careful at waterholes if birds with white dorsal or ventral wing feathers e.g. egrets & storks are present. Saddle-billed Storks (Ephippiorhynchus senegalensis) had just caught a common barbel (Clarias gariepinus) when an African Fish Eagle (Haliaeetus vocifer), with a loud scream, swept down and unsucessfully tried to steal their catch. Shingwedzi, Kruger National Park,, South Africa.